Welcome, WELCOME, the the BEST interview with The Tropical Dog! Hi! We are super excited to be part of this special series! I have been following Montecristo Travels before creating my own blog a year ago, and it has been a real source of inspiration. So, thank you so much for the invitation. First off, can you tell us a little bit about yourselves? Who is who? Do you have a basecamp town or country? How did you two find each other? The Tropical Dog is a blog about a thirty- year-old Greek-Moroccan girl and a three-year-old Mauritian dog who travel the world together. I am Maria and my travel companion is Shark. She is a mixed Border Collie from Rodrigues Island, a small and unknown paradise that belongs to Mauritius, in the middle of the Indian Ocean. As to how we met, well that’s quite a long story that you can read here. But basically, my neighbor’s dog gave birth in my garden when I was living in Rodrigues and I ended up keeping one of the puppies. Because we have been traveling since then, we don’t really have a basecamp. We build a new basecamp in every country we visit. How many countries have you two visited so far? Do you have a favourite? (I know, that is such a tough question!) And where was the biggest challenge and why? Together, we have been to five countries on three continents during the last 18 months: Mauritius, Morocco, Greece, France, and Colombia. As we are (very) slow travellers, we never spend less than two months in a country. We can stay up to a year if I find a job on the spot. That allows me to earn my living and deeply explore the country with Shark. If I had to choose my favorite place, well … I’d say Greece. We went there for a 2-month summer vacation in 2015 so we were together all the time. We swam every day, went on many road trips, and had so much fun! As to the most challenging country, no doubt I’d say Mauritius because it was the starting point of our travels. The first step is always the most difficult. At that time, I had no clue about travelling with a pet so I did a lot of research on the internet. And as we were living on a small and isolated island, I had to fly to another island to buy the vaccines and the container for Shark. Love gives wings, right? So I just did whatever it took to bring her with me. I have to ask: what do you believe is the best part about having a pet with you while you travel? I know that for us, having a pet brings a variety of enhanced experiences. The most unexpected and best one is that we aren’t treated like tourists. People think we live there and so the entire vib” changes. We don’t feel targeted by the tourism industry. What is your take? It’s hard to choose just one! I have highlighted 10 reasons to travel with a dog in this post. But I guess the best part for a solo traveller like me is that travelling with your pet gives you the opportunity to meet friendly locals and get their insiders’ tips. A dog is often a nice attraction and a good conversation starter. When I moved out to Cartagena, Colombia, I knew absolutely nobody. Within a week, I had made friends with all the dog owners of the neighborhood and knew the best local restaurants, the cheapest market, the best vet, etc. Whether you are shy or confident, your dog is an excellent asset for meeting people in a foreign place. We know a lot about flying in-cabin with a small dog. Can you walk us through what it means to have a big dog flying cargo? Are people’s concerns warranted? What airlines are better at it? What is the big #1 tip you would like to share? Gather all the information about the airline and the country’s requirements. Follow the rules strictly to avoid any problem. Keep in mind at every step that I am responsible for my dog’s safety. That means always double check the container before leaving home to make sure nothing is missing (water bowl, zip ties, toy, sticker with my information …), always arrive well in advance at the airport to allow Shark to relax and walk, and once on the plane, I always ask the crew to confirm that my dog was boarded and that the pilot is informed that a pet is travelling in the hold. Like everybody, I thought that pets were drugged when traveling in the hold. Well that is a legend. Shark never took anything before a flight on the advice of my vet but also because most airlines refuse to board an unconscious or sleepy pet. That’s the case with Air France, the airline I always prefer to travel with because I trust them. All the rules about pet transportation are clearly explained on their website; their rates are fixed according to the distance, not the weight of the animal; and the crew always reassures me about the conditions in the hold. Though I keep dreaming of the day airlines let large dogs travel in-cabin! For more information about traveling with a dog by air, read this post. What have you learned about your pet on the road? Something you are convinced you would not know had you not taken this adventurous route. For us, it’s the fearlessness that seems to come out when on the road and the fact that we are far less likely to coddle “the small dog.” After hiking up Mount Zeus in Greece on all four paws (8 km round trip in one day), we now know that being 8 inches off the ground is not an impediment to full-out adventure travel. Now we are planning a trip to Peru! So we learned not to underestimate endurance. What about you? The more we travel together, the more I discover my dog’s fantastic adaptability. She adapts very quickly to everything: a new means of transport, a new home, a new country … . For example, a few months ago, Shark took her very first boat trip in the bay of Cartagena, Colombia. I was a bit stressed out but I trusted her. We first took a small dinghy. She jumped in, not afraid at all, and found her balance within a few seconds. Then on the sailboat, after smelling around every part of it and meeting the crew, she took her place on a bench as if she was at home, and enjoyed the trip. She felt comfortable even when the boat was rolling on the waves. When we dropped anchor in the bay, she started barking at other boats that got too close. She was protecting her new territory. Since then, I’ve taken her on many other boat trips: on a catamaran, a speedboat, and a canoe. I know she loves it and that opens new horizons for us! How do you choose where to go next? Do you feel boxed in or limited by having your dog as your travel partner? I have never felt boxed in or limited because I travel with my dog. It’s even the opposite. My dog actually helps me to choose our next destination. As with every travel lover, the whole world is on my bucket list and I always have a hard time choosing where to go. But because pet import regulations can be very strict in some countries (quarantine, official authorization, a lot of paperwork), my list got shorter and it’s now easier to choose. My absolute priority is to share my travels with Shark, so the truth is, it doesn’t matter where we go if we can go together. THANK YOU so much for taking the time to chat with us today. I can’t wait to see where you are off to next and I assure you we will continue to follow you on your blog, FB and on Instagram! I love that you are showing the world that BIG dog international travel is not only possible, but a plus! The pleasure was all ours! I hope that other people will be inspired by our stories and will take their dog along on their next trip! Hope to meet you somewhere in the world. Shark and Montecristo epitomize that expression, “It’s a dog’s life.” Our dog, Dino has only traveled as far as Boston from Philadelphia, but he’s a great car passenger. If I can get Mr. Excitement to agree, I’d love to take him in a longer road trip. Hi Susanne! Shark and Montecristo are definitely living a dog’s life! I wish you and Dino a longer road trip very soon! Have fun together! YES!! that would be awesome! for all of you! maybe start small like say … a trip to Ottawa? Absolutely Luna! Maria and her Shark are a fabulous example of pet travel. Just like we do they have taken it far beyond the road trip or cottage country. I love that like us, it’s international in flavour! People often tell us “well you are lucky you are only 3.5 pounds so easy in-cabin options” … and I keep thinking … BIG dogs must travel too! and here is proof in the pudding. Maria and her Shark prove that big dogs fly too! Yes and BIG dogs can fly!! Just love that! It’s always so fascinating to see larger dog travel! People seem to think you can only travel with the little guys, and it’s refreshing to see dogs of all sizes accompanying their families. Love the Greece photos! Isn’t it just? It was why we were SO excited to have them on our blog! I know one young man that surfs all the big waves ands dog – a golden – is always with him. So … it CAN be done! Ah well … I am sure our day will come too in the meantime we hit the road as much as we can. 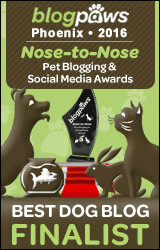 We ARE hoping to make it to blogpaws next year. After all… BEACH!!! What an interesting interview. We travel with our dogs all of the time, but have never flown with them. I think shipping them in the hold would be the hardest part for us. Thank you! I’m really glad you liked the interview Believe me, the first time I flew with Shark in the hold, I spend the whole time stressing out and praying! And I keep doing it every time we fly together… I guess now she is quite used to it and she knows that we’re going for new adventures when I put her in her container Safe travels to you and your beautiful brown dogs! I have spoken to a few people who do … and the ONE feedback I always get (and maybe Maria and Shark can confirm) is that the human is always way more stressed about it than the dog actually is. And it gets easier the more you do it. Wow! That is certainly an adventurous way to live. My husband and I have been to Greece – it is beautiful. Hi Sadie! Thanks for your sweet comment! We loved Greece too! I just checked out your blog! You are very lucky to have so many pets Oh and I love your logo! We did as well… a wonderful sailing trip of the islands I hope we get to go back! I have a Pelican on Mykonos to visit! I bet dogs are the greatest travel companions… unfortunately, I only have bratty cats.